John has a broad business background. He has run his own consultancy firm for many years, working with a range of organisations from customer service and telecommunications, to libraries and museums. He brings a breadth of experience in marketing and strategic planning. Born in England, John came to New Zealand 25 years ago with his Kiwi wife, Tooki who is one of our Student Services coordinators. They have two children, one studying for a computer science degree at University and one working for a local not-for-profit organisation. 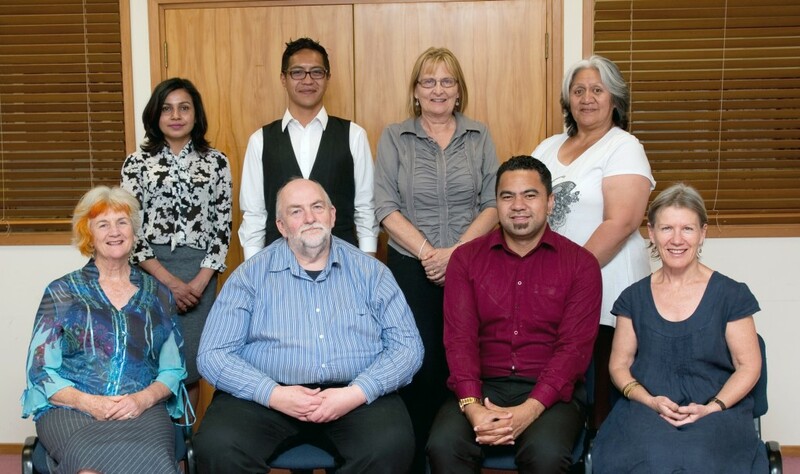 Currently manager of WEST – Waitakere Enterprise Skills and Training, (previously Waitakere WEA), sister organisation to Literacy Waitakere, Viv brings a wealth of community development training and expertise to her board role. Viv worked for many years in health, in many roles with early childhood services provider, Barnardos, as well as Life Works and NZ Blood Service. Community networker extraordinaire, Viv brings her social enterprise hat to the table, in a bid to guide transformation of underfunded community organisations from within. ? She is very involved in the Massey community where she lives. Viv is a JP and an avid theatre-goer and community gardener and is mother to 2 grown children. Will Flavell is currently the Head of Māori Studies at Rutherford College and elected member to the Henderson Massey Local Board (Auckland Council). He affiliates to several iwi including Ngā Puhi, Ngāti Whatua and Ngāti Maniapoto. He trained as a secondary school teacher at the University of Waikato and started his teaching career in 2007. In his spare time, Will enjoys playing sport particularly tennis, reading novels, hanging out with whānau and travelling around the world. Peter has been a tutor with Literacy Waitakere for two years starting as a tutor trainee in the 2013 intake. He particularly enjoys tutoring our Let’s Talk and computer groups. Peter has been member of Te Rōpū Mātua for one year. Peter affiliates to Waitaha and Kai Tahu Iwi in the South Island and Nga Puhi in the North and is a fluent Te Reo speaker. Peter has an interesting and varied background in hospitality from working behind a bar in Barcelona to training baristas in Tasmania and managing a restaurant in Melbourne. In his spare time, Peter can be found reading, walking, enjoying coffee with friends and spending time with his nephew. Patsy brings a wealth of experience to her role on the governance committee having worked for many years as an IT specialist in the private sector and more recently working as a literacy tutor and manager at Adult Literacy Tamaki Auckland Inc. (ALTA). In addition she has worked in business development with New Zealand Trade & Enterprise assisting companies develop their export markets. She enjoys travel, cycle touring, sailing and reading. Sanj is a chartered accountant with broad experience in all aspects of financial and management accounting gained within the public and commercial sector. On the personal front she is committed to improving the welfare of animals, the elderly and children in the society and very passionate about education and raising the literacy levels in our community. She enjoys travel, yoga and walking her dog. As Mana Whakarite – Manager – of Literacy Waitakere for the past 11 years, Jane brings a business and people management focus to the organisation from a diverse career in small business, including her own. Capacity building has been her focus, as well as creating a vibrant and supportive workplace, learning about the literacy and community sectors at the same time. She juggles two sporty teenagers with her work and enjoys being a linguist, a foodie, a skier and attends writers’ festivals when she can.